Hooray! We celebrate Thanksgiving tomorrow in the United States, and that’s a holiday I can really get behind because it’s a hard one to commercialize. Oh, they try to sell you dishes and linens and tureens, but the fact still remains that all you really need is a hot meal, some family, and football on TV. And gratitude in your heart, let’s not forget that. Once upon a time, when I was at home keeping the girls alive as babies and toddlers, we hosted Thanksgiving. One year, we had 36 people crammed into the house — Abby’s room became the makeshift man cave for football, we had desserts in the laundry room, and tables and chairs sat end to end in the living/dining area. It was pretty fun. Another time, we had nine — my parents, Eric’s parents and grandma, and us. That was also pretty fun. 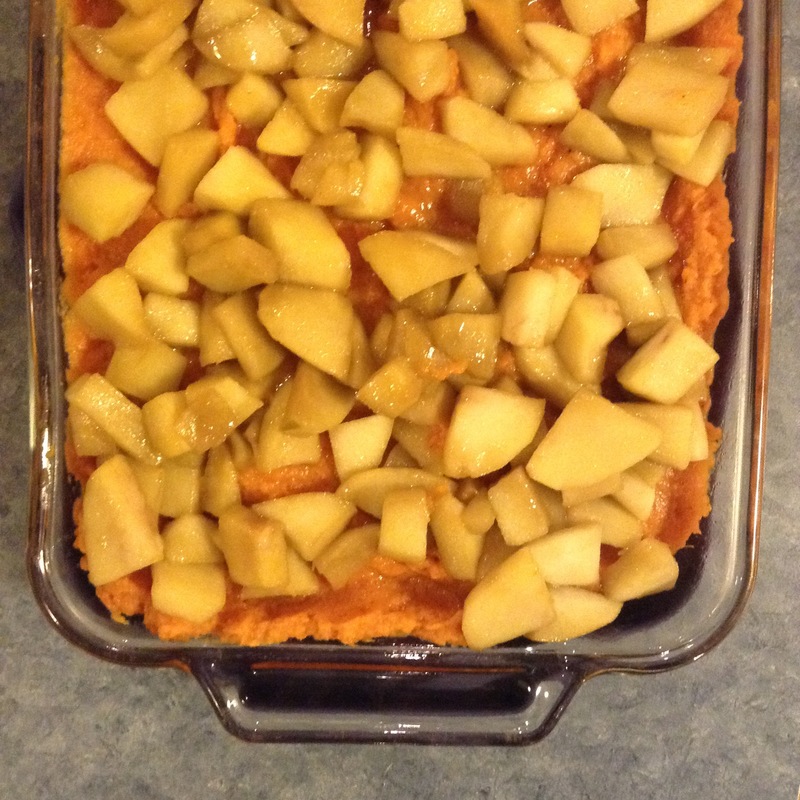 One of my very favorite Thanksgiving dishes is this sweet potato recipe from O Magazine. A look at the ingredient list shows it’s not terrible on the zero waste meter — I purchased a couple huge, beautiful sweet potatoes at my favorite farm stand, I get Amish butter wrapped in paper, and my herbs and spices all come from the bulk bins. Orange juice equals fresh squeezed in my world (bulk produce), and apples aren’t something we’re lacking here in orchard country (you name a variety, I can get it). What I can’t get zero waste: heavy cream and brown sugar. I mean, that’s hardly the end of the world, but this is month seven of the project and I am stepping up my game. So I decided to use the milk I already buy in recyclable jugs — not exactly heavy cream, but it does the job, especially since this recipe isn’t exactly lacking in the butter department. As for brown sugar, there are a few options: sucanat (which I got months ago at Market of Choice in Eugene), honey (locally produced and packaged in a glass jar), or maple syrup (bulk, if you can believe it — and yes, I know I’m lucky). 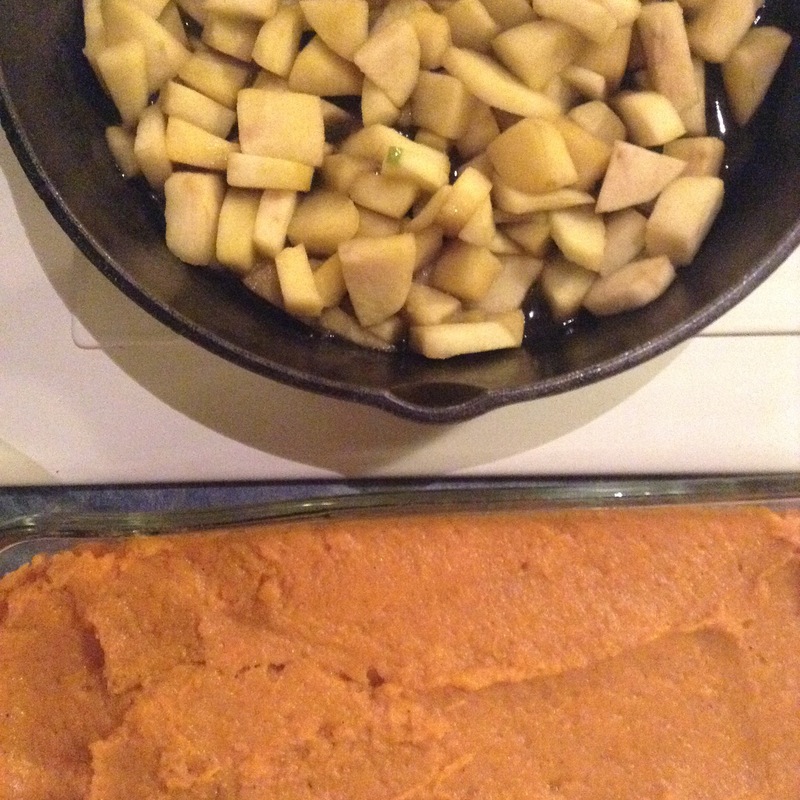 I decided to go maple syrup in the potatoes and sucanat for the apple topping. I told you they’re huge. Apple topping and mashed sweets. And done. Not quite as creamy because I didn’t use cream. But the taste is (mostly) there. 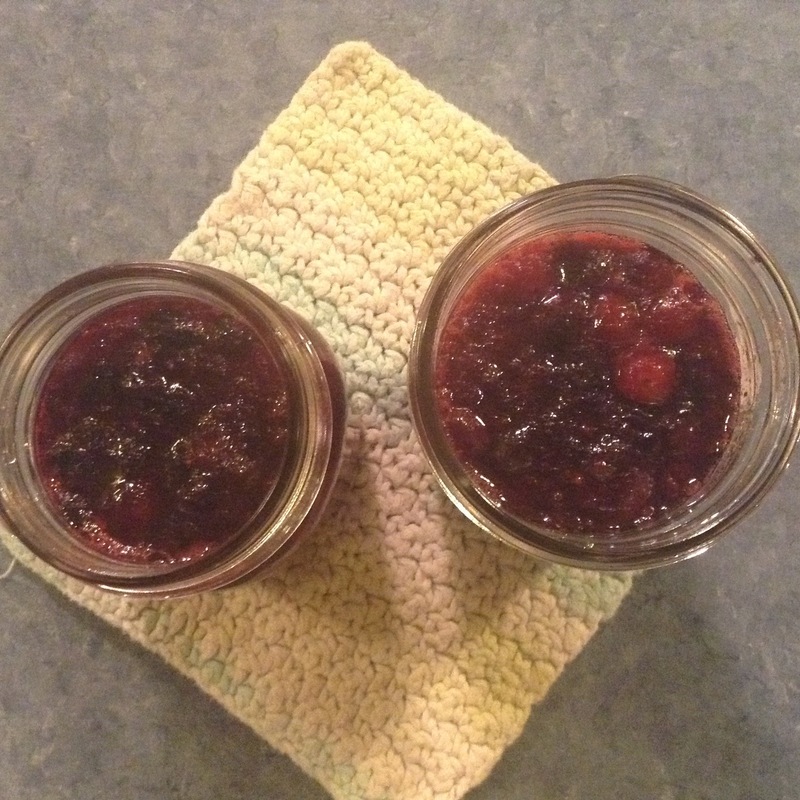 The second thing I’m usually tasked with bringing is cranberry sauce, a la Joy of Cooking. Copyrights, etc., but let’s just say you could theoretically take a 12 ounce / one pound package of cranberries and cook them with 2 cups of sugar, 1/2 cup of water, 1/2 cup of orange juice and some orange zest for, like, 7 to 10 minutes, watching it carefully because it will boil over the second you turn your back. There isn’t a way for me to get fresh cranberries here; we simply don’t grow them. So I’m not sure how to zero waste the main part of the whole ordeal (the rest of it? No problem). But this brings about some big questions: Is it better to just buy the bag of cranberries, or drive somewhere to get them freshly harvested in my own container? What takes up more resources? How much is time worth? Do you just buy the canned stuff and call it a day? Or do you insist on making it fresh because your stomach is a jerk and you can’t eat it otherwise? Update: So when I wrote this post Tuesday night, I had every intention of purchasing a package of cranberries today (Wednesday). But the more I thought about it, the worse I felt. I’d just written that I was stepping up my game — were my actions reflecting that? So. There’s an organic market in town that I broke up with for a number of reasons, one of them being that all of their produce is presorted into plastic bags. But if anyone in town was going to have bulk cranberries, it would be them. I made a stop after work, bringing in a reusable produce bag, thinking if I did find some, maybe they could reuse any plastic packaging. But it didn’t matter because they didn’t have any. Like, at all. 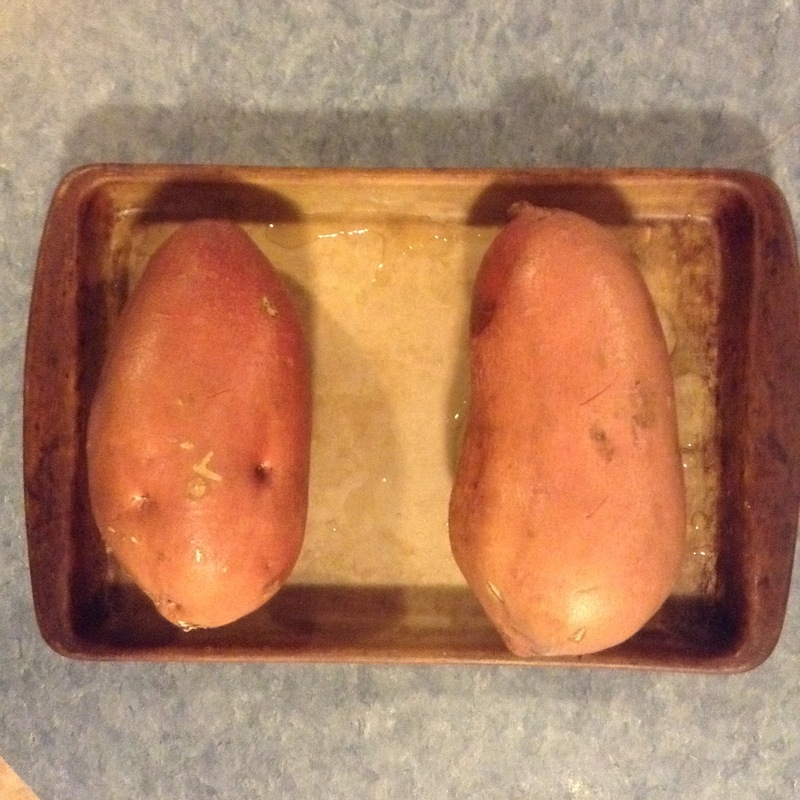 Off to the grocery store, which, incidentally, was a terrible idea the night before Thanksgiving. That place was packed. I took my reusable produce bag in even though I knew that finding loose cranberries would be an act of God. I asked a kid in the produce section, and he was like, I’m sorry ma’am (MA’AM. Geez, I’m old), but we don’t. And I was like, I figured, but I had to check. And then grabbed my 12 ounce package of cranberries. Back at home, I googled “ocean spray cranberry packaging” and lo and behold, that bag is number 4 plastic, which can generally be recycled with plastic bags. I’m not sure that makes it better — I mean, it’s still going to end up in the landfill eventually — but at least that part is delayed a while longer. It took me longer to purchase cranberries and research the bag than it did to actually make the sauce. It made a quart, which I divided into two pints — I’ll save the other one for Christmas so I don’t have to fret about this again. Is it just me, or does this look like a face? Bonus recipe: Have you all been introduced to the beauty that is King Arthur’s Beautiful Burger Buns? These make fantastic buns (duh), but also make really great grandma-style pan rolls. My mother makes these literally every single week; it’s also what she uses for her stuffing recipe. For me, this is totally zero waste because: Amish butter in paper, eggs from Beth (hi, Beth! ), and flour, sugar, salt and yeast all available in bulk. Bonus bonus recipe: Mom also uses this as a base for cinnamon rolls (flatten out, spread with melted butter and sprinkle with sugar and cinnamon; roll up, cut and bake. Wait, HERE is a link that gives better general instructions. Thanks, wikiHow). Now, your turn: Did you remake / plan to revise any favorite holiday recipes this year? How did you do it? How did it work out?